Mentioned is the way you can write Music Teacher Resume Template. 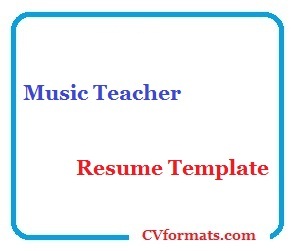 People looking for jobs can easily download these Music Teacher Resume Template in word or pdf format or just view it online to copy and paste. Cover letter of Music Teacher Resume Template is also available. Just change the name , address , qualification and experience and your Music Teacher Resume Template is ready. I am a qualified and professional music teacher with a high level of experience and a zest for sharing my passion for all things musical. Well acquainted with the NSW syllabus, I hold a strong belief that music can change lives for the better. I seek to equip students with the performance, composition and theoretical skills that will see them excel no matter which path they take in music. An engaged and determined teacher, I thrive teaching both one-on-one and in group scenarios. Conducted classes on five afternoons per week, often with student load of 20 or more. Worked towards and oversaw student performances at numerous local events. Conducted ‘Music for the unmusical: finding music in unexpected places’ workshops at the Newcastle Musica! Festival. Based on the idea that you don’t need a formal instrument to make music, these workshops were very popular with children, as well as parents who wanted to connect musically with their kids. Received recognition from local council for commitment to community music development.